At Affordable Insulation of Oklahoma, you’ll find our motto right on our website — ‘A comfortable home shouldn’t be a luxury.’ In fact, we believe that every home should be a place where people can go to relax, find comfort, and feel their best. High quality insulation of any kind shouldn’t be something homeowners feel they can’t afford, or that they don’t need. Insulation can do so much to boost a home’s value, and above all, provide a sense of warmth, comfort, and security from the elements. No matter where you live, or which time of climate typically surrounds your home, having insulation installed can really make a huge difference in the overall feel and comfort level of your home. Can’t decide which insulation might be right for your home? Let’s go ahead and break down a few types of insulation services we offer at Affordable Insulation. Of course, if you don’t see a particular type of insulation listed below, feel free to check our site to see what else we offer, or give us a call. We’re always happy to discuss custom projects that fit the needs of your home. After all, no two houses are alike, and no two insulation jobs are alike. We take pride in finding the right solution for your home, no matter what kind of insulation and service it requires. Foam insulation is one of the most innovative and quality forms of insulation you can have in your home. It provides a tight seal, is quick to install, and is one of the best ways to ensure what’s on the outside of your home stays where it belongs! Get rid of excess noise, moisture, and drafts when you achieve the air-tight seal from spray foam insulation just about anywhere in your house. It’s great for attics, basements, etc. Spray foam insulation is sprayed on as a liquid, and dries into a solid to provide an extremely efficient, tight seal. It’s effectiveness is ranked above just about every other type of insulation available, and though the initial installation investment may be a bit higher than other varieties, it can help save on heating costs, potential water damage, etc. It also doesn’t need to be replaced as often as other insulations. By having spray foam insulation installed, you’re really protecting your home from the elements, which can quickly turn into savings for your wallet! 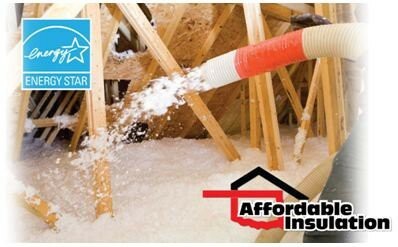 Great for attics, crawl spaces, or anywhere that needs a heavy-duty insulation that will keep allergens out, and clean, crisp air in. Blown-in insulation is an affordable solution when it comes to really getting in the tightest spaces of your home. You know those little crevices that allergens can sneak through. Sometimes, traditional insulation can’t fit its way into every corner, making blown-in insulation an extremely effective solution. As you may expect, this fiberglass insulation is actually ‘blown in’ into tight or awkward spots, so every crack is filled, and everything is sealed properly. It’s an economical and environmentally-conscious choice for anyone looking to insulate their home or attic space securely. Don’t worry about any pesky missed spaces with traditional fiberglass insulation — with blown-in insulation, they’ll be patched up in no time, so anyone will be able to enjoy every room in your house — even rooms that are typically drafty, etc. install them. If you’re willing to get a little DIY with your installation, purchasing the right batts for your home is a great way to start. You can then cut down the insulation as you need, in order to be able to fit in tight or awkward spaces. It’s an original when it comes to keeping your home energy efficient, and is resistant to many different types of elements, keeping your home safe, dry, and warm. It can also help to reduce noise from room to room, or from the outside in. Fiberglass insulation is one of the easiest and quickest forms of insulation you can choose, and if you can do it yourself, you can even choose to ‘pad’ extra areas thicker, or with less, depending on the specific needs of your house. It’s customizable in its versatility, and a perfect solution for anyone looking for quality insulation on a budget. When we say ‘a comfortable home shouldn’t be a luxury,’ we mean it, and stand by that statement with every type of insulation and service we provide. If you have any questions about these, or other types of insulations or services, please don’t hesitate to contact us at any time.